"My daughters and I love growing heirloom purple hull peas, cowpeas, and black-eyed peas in our garden. This delicious Moroccan-style recipe smells so good while cooking and tastes so yummy." Place black-eyed peas into a large container and cover with several inches of cool water; let stand for 8 hours to overnight. Drain and rinse peas. Combine peas, onion, tomato sauce, olive oil, cilantro, garlic, salt, cumin, paprika, ginger, and cayenne pepper in a stockpot; pour 3 1/2 cups water over pea mixture. Bring water to a boil, decrease heat to low, cover pot, and simmer, stirring occasionally and adding more water if sauce gets too thick, until peas are tender, about 1 1/2 hours. If using fresh picked peas, omit soaking process and reduce cook time by half. Fresh parsley can be substituted for fresh cilantro. Hungarian paprika can be substituted for sweet paprika. Quick-soak method for peas: add washed peas to pot of boiling water; immediately remove from heat and soak for 1 to 1 1/2 hours. Needed something to do with lots of farmer's market purple hull peas and this is the ticket! So good! This was good. 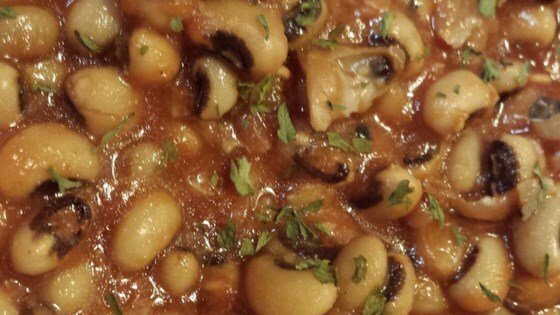 I'm not too familiar with making black eyed peas and look forward to making them again. I would add some garlic next time. Delicious just as the recipe is written. I served it over brown rice. It froze well for lunches too! Added a .5 can of tomato paste. Cut olive to .25 cup. I've made this three times. I add a couple slices of salt port instead of the salt.